We’re moving from rustic to nautical with our next set of wedding invitations. Jaclyn and Jason worked with Diane of Faye + Co. for their Atlantic City wedding invitations – you might also remember Diane’s awesome sailor tattoo wedding invitations from a couple of years ago. Jaclyn and Jason chose a completely nautical theme for their invitations, with beautiful illustrations and hand lettering by Diane. From Diane: Jaclyn and Jason are a fun couple and wanted the seaside reflected in their wedding invitations. 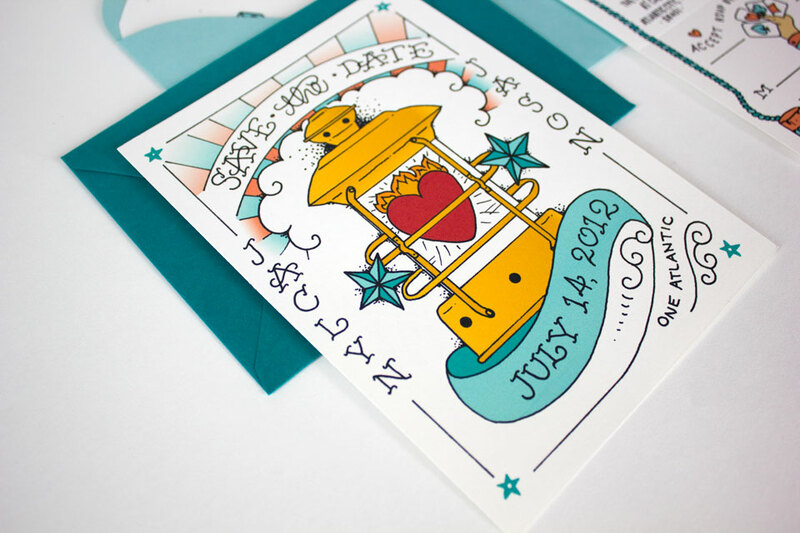 First we set the tone with a save the date postcard, using hand-drawn artwork of a nautical lantern. On the invitations, we went all out! From a tattoo-inspired anchor, to the dock-style posts, a rope border around the entire piece, to bits of inspiration from Atlantic City featured on the envelope liner. This style invitation was a first for me, since the invitation folded vertically instead of a standard gatefold or trifold invitation. At the bottom of the invitation was a perforated rsvp postcard that could be separated from the rest of the invitation with ease. Not too long after sending off the invitations, I was contacted to design the bridal shower invitations as well – I was ecstatic! From the save the date and invitation, all the way through to the bridal shower, this couple has a stylish set of stationery for their wedding. Photo Credits: Faye + Co. I love this design! 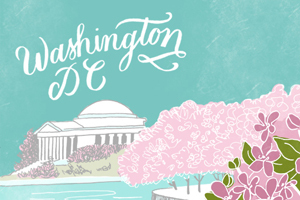 I especially like the Save the Date and the envelope liners — such a fabulous touch. Thanks for sharing! Oh yeah, the envelope liners are so awesome for this one!